EARLY PLANS: As early as 1964, the Regional Plan Association proposed a new freeway from I-80 in Netcong to the proposed NJ 23 Freeway in Hamburg. In this early proposal, the freeway, which was designated NJ 94, was to follow US 206 from Netcong north to Newtown, and then follow the existing NJ 94 northeast to Hamburg. In 1966, the Tri-State Transportation Commission advocated construction of a 35-mile-long freeway along the US 206 corridor. Beginning just north of the junction of I-287 and I-78 in Bedminster, Somerset County, the US 206 Freeway was to continue north past I-80 in Netcong, and end in Newton, Sussex County. The route was to serve three purposes: to take traffic off local two-lane roads, to serve as an outer-outer bypass of the metropolitan area and the I-287 corridor, and to connect to recreation areas. PART OF THE NORTHWEST FREEWAY NETWORK: In the late 1960's and early 1970's, the New Jersey Department of Transportation (NJDOT) proposed a network of new freeways to serve the northwest part of the state. Beginning at I-80 in Netcong, and extending northwest to Montague at the New Jersey-Pennsylvania border, the US 206 Freeway was to connect to proposed freeways along the NJ 94 and NJ 15 corridors, and to a proposed northern extension of the NJ 31 Freeway along the perimeter of the Delaware Water Gap National Recreation Area. 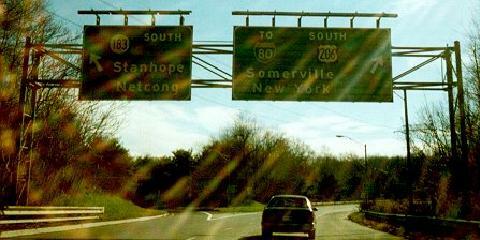 The US 206 Freeway from the Netcong-Stanhope area north to Montague will serve a dual purpose. First, in conjunction with the NJ 94 Freeway, it will provide a complete bypass of Newton, allowing for the orderly development of this expanding community. Second, it will serve as one of the main feeder routes to the Tocks Island complex. The NJDOT estimated the cost of the 30.5-mile-long US 206 Freeway at $104 million. Between the proposed NJ 94 Freeway in Newton and the proposed NJ 15 Freeway in Ross Corner, the US 206 Freeway was to have been dually signed with NJ 94. By the mid-1970's, fiscal and environmental concerns ultimately led the NJDOT to cancel the ambitious northwest New Jersey network, including the US 206 Freeway. SOURCES: "Expressway Plans," Regional Plan Association News (May 1964); Transportation 1985: A Regional Plan, Tri-State Transportation Commission (1966); New Jersey Highway Facts, New Jersey Department of Transportation (1969); "Interstate 80-84 Links Opposed," The New York Times (11/27/1972); Master Plan for Transportation, New Jersey Department of Transportation (1972); Raymond C. Martin; Dan Moraseski. US 206 shield by Ralph Herman.